Chemistry fans often refer to Oct. 23 as “Mole Day,” since the numbers 10 and 23 are part of a basic constant in chemistry, the mole. This unit describes how many atoms exist in a given sample of any substance, so scientists use moles to simplify lots of calculations. For example, when an average nuclear reactor first starts up its core has about 120,000 kilograms of uranium in its fuel. A mole of uranium weighs about 238 grams, so a brand-new core has about 504,000 moles of uranium. A plant scientist or NRC specialist would base some core calculations on a more exact definition of moles in the core. Author ModeratorPosted on February 24, 2015 February 11, 2016 Categories Dry Casks 101, Radioactive Waste, Science 101Tags basic science, nuclear power plants, spent nuclear fuel, uranium7 Comments on Science 101 – What is Nuclear Fuel? 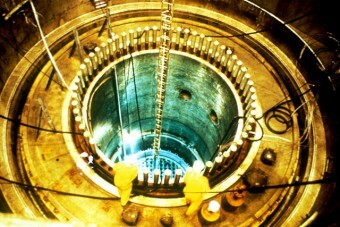 The primary active ingredient in nuclear reactor fuel is a particular variety, or “isotope,” of uranium, called U235. 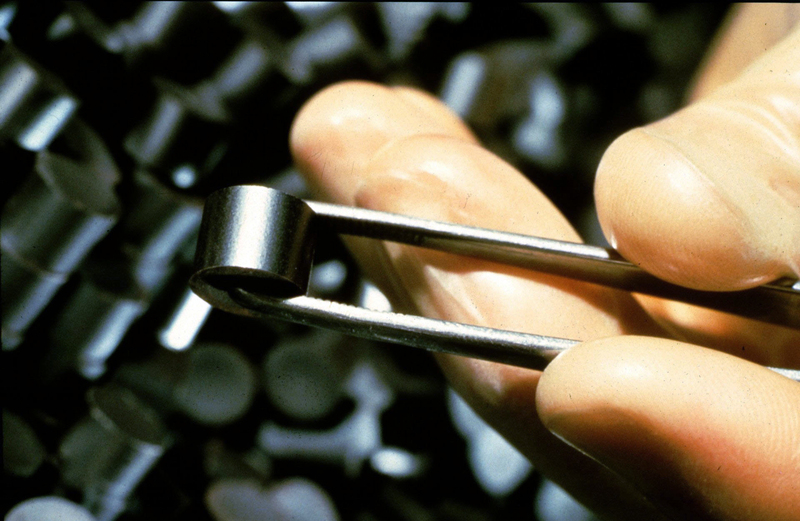 U235 is relatively rare — only about 0.7% of uranium as it exists in nature is U235. Uranium must be enriched to contain about 5% U235 to function properly as fuel for a U.S. commercial nuclear power plant. U235 has 92 protons and 143 neutrons. Protons and neutrons are some of the almost unimaginably tiny particles that make up the nucleus of an atom — see Science 101 Blog #1. All other isotopes of uranium also have 92 protons, but different isotopes have slightly different numbers of neutrons. Uranium is a radioactive element. Uranium atoms break apart, or disintegrate, into smaller atoms, releasing energy and a few leftover neutrons in the process. This happens very slowly for U235. If you have some U235 today, in about 700 million years you will have only half as much. You will have the remaining U235, plus the smaller atoms. The energy released will have gone into the environment too slowly to be noticed, and the extra neutrons will have been absorbed by other atoms. While this happens very slowly, the disintegration of each individual atom happens very quickly, and the fragments are ejected at a very high speed. Those high-speed fragments are the source of the heat generated by the reactor. Under the right man-made conditions, the number of U235 atoms that disintegrate each second can be increased. When a U235 atom disintegrates, it releases some neutrons. Some of those neutrons can be made to interact with other U235 atoms, causing them to disintegrate as well. Those “target” atoms release more neutrons when they disintegrate, and then those neutrons interact with still other U235 atoms, and so on. This is called a “chain reaction.” This process does not work well for other isotopes of uranium, which is why the uranium needs to be enriched in U235 for use as nuclear fuel. Most of the energy released when a U235 atom disintegrates is in the form of kinetic energy — the energy of physical motion. The fragments of the disintegrated atom collide with nearby atoms and set them vibrating. That vibration constitutes heat. The fuel rods get hot as the reaction progresses. The faster the chain reaction — that is, the larger the number of U235 atoms that disintegrate each second — the faster energy is released and the hotter the fuel rods become. 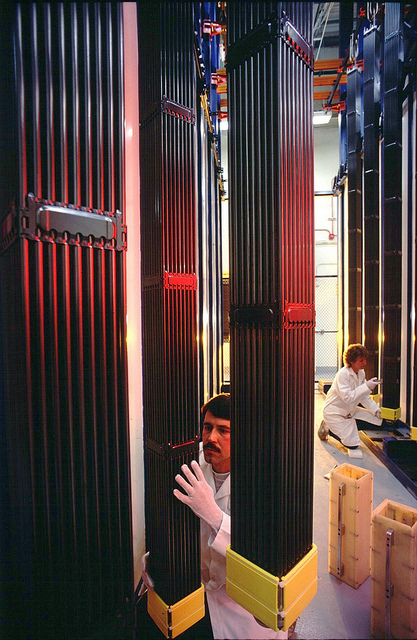 The people in charge of the reactor can control the chain reaction by preventing some or all of the released neutrons from interacting with U235 atoms. The physical arrangement of the fuel rods, the low U235 concentration, and other design factors, also limit the number of neutrons that can interact with U235 atoms. The heat generated by the chain reaction is used to make steam, and that steam powers specialized machinery that drives an electrical generator, generating electricity. Science 101 will look at how that works in more detail in a later issue. The author has a BS in Electrical Engineering from Carnegie-Mellon University. In earlier Science 101 posts, we talked about ionizing radiation and different types of radiation. In this post, we’ll look at the Geiger counter, an instrument that can detect radiation. Just to recap, the core of an atom (the nucleus) is surrounded by orbiting electrons, like planets around a sun. The electrons have a negative charge and usually cancel out an equal number of positively charged protons in the nucleus. But if an electron absorbs energy from radiation, it can be pushed out of its orbit. This action is called “ionization” and creates an “ion pair”—a free, negatively charged electron and a positively charged atom. Humans cannot detect creation of an ion pair through their five senses. But the Geiger counter is an instrument sensitive enough to detect ionization. Most of us have heard or seen a Geiger counter. They are the least expensive electronic device that can tell you there is radiation around you—though it can’t tell you the original source of the radiation, what type it is or how much energy it has. How does it work? A Geiger counter has two main parts—a sealed tube, or chamber, filled with gas, and an information display. Radiation enters the tube and when it collides with the gas, it pushes an electron away from the gas atom and creates an ion pair. A wire in the middle of the tube attracts electrons, creating other ion pairs and sending a current through the wire. The current goes to the information display and moves a needle across a scale or makes a number display on a screen. These devices usually provide “counts per minute,” or the number of ion pairs created every 60 seconds. If the loud speaker is on, it clicks every time an ion pair is created. The number of clicks indicates how much radiation is entering the Geiger counter chamber. You hear a clicking sound as soon as you turn on the speaker because there is always some radiation in the background. This radiation comes from the sun, natural uranium in the soil, radon, certain types of rock such as granite, plants and food, even other people and animals. The background counts per minute will vary; the needle will move or the number will change even when there is no know radiation source nearby. Many different things cause this fluctuation, including wind, soil moisture, precipitation (rain or snow), temperature, atmospheric conditions, altitude and indoor ventilation. Other factors in readings include geographical location (higher elevations give higher counts), the size and shape of the detector, and how the detector is built (different chamber material and different gases). Depending on the elevation and the type of Geiger counter, a typical natural background radiation level is anywhere from five to 60 counts per minute or more. Because background radiation rates vary randomly, you might see that range standing in one spot. It is important to understand that the Geiger counter indicates when an ion pair is created, but nothing about the type of radiation or its energy. Other types of instruments can provide an exposure rate (expressed as milliroentgen per hour or mR/hr). These counters must be calibrated to read a particular type of radiation (alpha, beta, gamma, neutron, x-ray) as well as the amount of energy emitted. The reading will only be accurate for that type of radiation and that energy level. And these instruments need to be calibrated regularly to be sure they are providing correct information over time. For more sophisticated environmental radiation readings, check out the Environmental Protection Agency’s nationwide system, RadNet. Using equipment far more sensitive than a Geiger counter, it continuously monitors the air and regularly samples precipitation, drinking water and pasteurized milk. Over its 40-year history, RadNet has developed an extensive nationwide “baseline” of normal background levels. By comparing this baseline to measurements across the U.S. states in March 2011, following the accident at the Fukushima reactors in Japan, the EPA was able to detect very small radiation increases in several western states. EPA detected radiation from Japan that was 100,000 times lower than natural background radiation—far below any level that would be of concern. And well below anything that would be evident using a simple Geiger counter, or even Geiger counters spread across the country. If RadNet were to detect a meaningful increase in radiation above the baseline, EPA would investigate immediately. With its nationwide system of monitors and sophisticated analytical capability, RadNet is the definitive source for accurate information on radiation levels in the environment in the U.S.
By the way, the Geiger counter is also called a Geiger-Mueller tube, or a G-M counter. It was named after Hans Geiger, a German scientist, who worked on detecting radiation in the early 1900s. Walter Mueller, a graduate PhD student of Geiger’s, perfected the gas-sealed detector in the late 1920s and received credit for his work when he gave his name to the Geiger-Mueller tube. In earlier Science 101 posts, we talked about what makes up atoms, chemicals, matter and ionizing radiation. In this post, we will look at the different kinds of radiation. There are four major types of radiation: alpha, beta, neutrons, and electromagnetic waves such as gamma rays. They differ in mass, energy and how deeply they penetrate people and objects. The first is an alpha particle. These particles consist of two protons and two neutrons and are the heaviest type of radiation particle. Many of the naturally occurring radioactive materials in the earth, like uranium and thorium, emit alpha particles. An example most people are familiar with is the radon in our homes. The second kind of radiation is a beta particle. It’s an electron that is not attached to an atom (see previous blog post). It has a small mass and a negative charge. Tritium, which is produced by cosmic radiation in the atmosphere and exists all around us, emits beta radiation. Carbon-14, used in carbon-dating of fossils and other artifacts, also emits beta particles. Carbon-dating simply makes use of the fact that carbon-14 is radioactive. If you measure the beta particles, it tells you how much carbon-14 is left in the fossil, which allows you to calculate how long ago the organism was alive. The third is a neutron. This is a particle that doesn’t have any charge and is present in the nucleus of an atom. Neutrons are commonly seen when uranium atoms split, or fission, in a nuclear reactor. If it wasn’t for the neutrons, you wouldn’t be able to sustain the nuclear reaction used to generate power. The last kind of radiation is electromagnetic radiation, like X-rays and gamma rays. They are probably the most familiar type of radiation because they are used widely in medical treatments. These rays are like sunlight, except they have more energy. Unlike the other kinds of radiation, there is no mass or charge. The amount of energy can range from very low, like in dental x-rays, to the very high levels seen in irradiators used to sterilize medical equipment. As mentioned, these different kinds of radiation travel different distances and have different abilities to penetrate, depending on their mass and their energy. The figure (right) shows the differences. Neutrons, because they don’t have any charge, don’t interact with materials very well and will go a very long way. The only way to stop them is with large quantities of water or other materials made of very light atoms. On the other hand, an alpha particle, because it’s very heavy and has a very large charge, doesn’t go very far at all. This means an alpha particle can’t even get through a sheet of paper. An alpha particle outside your body won’t even penetrate the surface of your skin. But, if you inhale or ingest material that emits alpha particles, sensitive tissue like the lungs can be exposed. This is why high levels of radon are considered a problem in your home. The ability to stop alpha particles so easily is useful in smoke detectors, because a little smoke in the chamber is enough to stop the alpha particle and trigger the alarm. Beta particles go a little farther than alpha particles. You could use a relatively small amount of shielding to stop them. They can get into your body but can’t go all the way through. To be useful in medical imaging, beta particles must be released by a material that is injected into the body. They can also be very useful in cancer therapy if you can put the radioactive material in a tumor. Gamma rays and x-rays can penetrate through the body. This is why they are useful in medicine—to show whether bones are broken or where there is tooth decay, or to locate a tumor. Shielding with dense materials like concrete and lead is used to avoid exposing sensitive internal organs or the people who may be working with this type of radiation. For example, the technician who does my dental x-rays puts a lead apron over me before taking the picture. That apron stops the x-rays from getting to the rest of my body. The technician stands behind the wall, which usually has some lead in it, to protect him or herself. Radiation is all around us, but that is not a reason to be afraid. Different types of radiation behave differently, and some forms can be very useful. For more information on radiation, please see our website. Don Cool, who holds a Ph.D. in radiation biology, advises the NRC on radiation safety and for 30 years has been active on international radiation safety committees. In the last Science 101 blog post, we discussed measurements made in various units of measure, particularly meters, grams and liters. You might be wondering where these units of measure come from and how they relate to one another. If so, you’re in luck, as that is the topic for today’s post. Quantities are characteristics or properties we are trying to measure, such as the length of an object. Units of measure are how we express measurements of quantities. For length, the unit we would use in science is meters. A unit is really only a particular amount of some quantity used as a reference point for measurements of that quantity. Put differently, units of measure are chosen and accepted by the people who use them. Often, units of measure were agreed upon many years ago. One meter is as long as it is because that’s what scientists agreed to use as a base unit for length. A meter could have been some other length. For the sake of establishing well-defined and easily-accessible units of measure, the General Conference of Weights and Measures (a collection of scientists from multiple countries) created in 1960 the Sytème International d’Unités (otherwise known as the SI¬). This system relies upon the base units of measure listed in the following table. Often times, however, the base unit of measure can be either too large or too small to be useful in describing a particular measurement. For example, while we could talk about the distances between cities in meters, we would be using very large (and, as such, cumbersome) numbers. For example, from Portland, Maine, to St. Louis, Missouri, is 2,060,000 m or 2,060 km. Similarly, if we are talking about the size of atoms, the basic building blocks of matter, speaking in terms of meters would be difficult as the diameter of a hydrogen atom is only 0.000000000120m. So, instead, for the sake of convenience, we often use prefixes to modify the size of the base unit. The following table lists a number of such prefixes using meter for the base. The above table lays out conversion factors, ratios that can be used to convert one unit to another. For example, one such ratio, expressing the relationship between kilometers and meters, would be 1 km / 1000m. Using this ratio, we can convert 12348m into 12.348km (12348m x 1km / 1000m). The NRC uses these same ideas when measuring radiation. These measurements will be discussed in an upcoming Science 101 post. 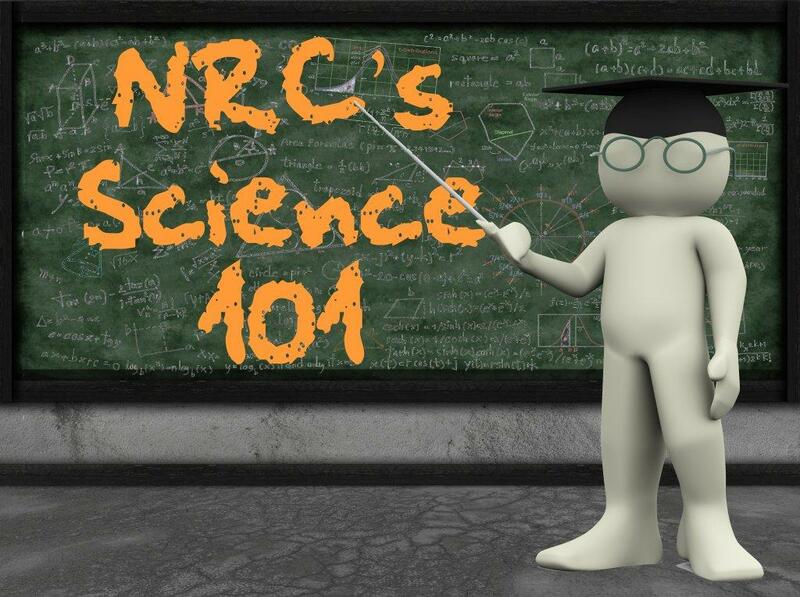 As always, thank you for reading the NRC’s Science 101 blog series. NRC Science 101 – What are Chemicals? In the last Science 101 blog post, we talked about the atoms, the basic building blocks of matter, and molecules. In this post, we’ll talk about chemicals, which are made up of a collection of molecules. A chemical is any substance that has a defined composition. In other words, a chemical is always made up of the same “stuff.” Some chemicals occur in nature, such as water. Other chemicals are manufactured, such as chlorine (used for bleaching fabrics or in swimming pools). Chemicals are all around you: the food you eat, the clothes you wear. You, in fact, are made up of a wide variety of chemicals. A chemical reaction refers to a change in a chemical. More generally, a chemical reaction can be understood as the process by which one or more substances change to produce one or more different substances. Chemical changes are different from physical changes, which don’t result in a change in substances. One example of a physical change is when water freezes into ice. While ice may have different physical properties, it is still just water. Another example is when you dissolve salt into a cup of water. While the salt may appear to disappear into the water, you still have water and salt—no substance changed into a completely new substance. Iron oxide, also known as rust, cannot become iron or oxygen again. It is a completely new substance. In the equation, the substances on the left-hand side of the arrow are considered reactants (the substances that participate in a chemical reaction). The substance on the right-hand side of the arrow is considered a product (a substance that results from a chemical reaction). It’s important to note from this example that no material is “lost” in the reaction. On one side of the equation you have iron and oxygen; on the other you still have iron and oxygen (now just combined into one chemical). In that sense, this example illustrates what is known as the law of conservation of mass. By “law,” we mean a general rule of how something works or how something occurs. This description is considered to be extremely reliable due to a large amount of supporting experimental testing and observation. Considering the given example, the law states the products of a chemical reaction have the same mass (“stuff”) as the reactants. In other words, while things are rearranged, nothing is created or destroyed. 1. You might notice bubbling or a change in odor, indicating the production of a gas. Such is the case when baking soda is mixed with vinegar. 2. When two clear solutions are mixed together and the resulting mixture is cloudy (due to the presence of some solid substance now in the liquids). This is known as the formation of a precipate. 3. A change of color (like in our rust example). 4. A change in temperature or if light is produced, such as with fire. While any of the above may be evidence of a chemical change, physical changes can have some of the same effects. One way to determine the difference between the two is to think about whether the new substance could be physically separated back into its original parts—in other words, if the involved matter could “go back” to how it originally was. The author has a bachelor’s degree in Nuclear Engineering and a master’s degree in Reliability Engineering. Author ModeratorPosted on September 12, 2013 September 19, 2013 Categories Science 101Tags basic science, chemicals, chemistry, NRC8 Comments on NRC Science 101 – What are Chemicals?